If you don’t have kids, then you may not be familiar with Thomas the Tank Engine (unless you read the recent stories about the toy being recalled due to lead paint). However, if you have a little boy (or two), then you’re probably an expert on Thomas and his friends James, Henry, Edward, and the other 80-odd engines that work on the Island of Sodor. Based on a series of short stories written 50 years ago, it’s become a multi-faceted brand, with television shows, toys, books, DVDs, and even a feature-length movie starring Peter Fonda and Alec Baldwin that is laughably bad. Personally, I think the Thomas toys are great. I’ve been building tracks for the boys for several years now, and there are times that think I’m doing it more for me than for them. 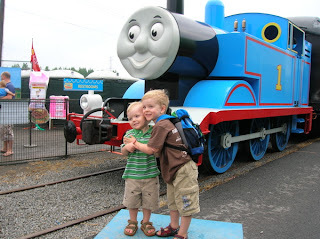 So, when we found out the actual Thomas the Tank Engine was coming to Ottawa, it was a no-brainer that we’d get tickets. Yesterday’s event was actually pretty cool. As you’ll see in the picture below, there was an acutual train engine that looks like Thomas, complete with a steam whistle and moving eyes. There were six coaches for passengers, and the train left each hour for a 25-minute trip. The only disappointing part was the route – the trainyards are in a pretty industrial part of town, so the view out the window was mostly of strip malls and distribution centres. Regardless, the boys loved it. In addition to the ride, there were train sets to play with, inflatable play structures, singers, a magician, clowns, movies, and of course a huge retail section that sold everthing from railway sets to Thomas toothbrushes. According to the local paper, about 16,000 people were expected to attend the four-day event. At $18 a pop, Thomas will probably need an extra coach to haul all that money back to the Island of Sodor. The boys look like they’re in danger of being run over by a maniacal train. 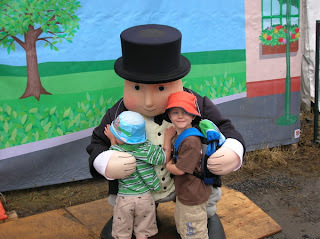 The boys with Sir Topham Hatt, the dictatorial ruler of the train system. Incidentally, he was originally known as the Fat Controller. 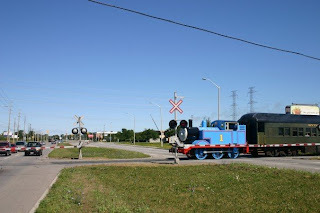 I think some people were pretty surprised to see a giant blue engine pulling coaches through the suburbs.